When it comes to completing major building projects, municipal governments and infrastructure engineering companies face a variety of unique challenges. While these projects have many of the same standards for accuracy, efficiency and safety as any other project, they must also make the most of the limited funding available to them. Since funding for infrastructure projects comes directly from taxpayers, municipal governments are beholden to make the most of that funding. One way engineers can do this is to keep the land surveying cost down. By working with an experienced land surveying partner, government agencies will be able to take advantage of innovative new technologies that offer the same quality of surveying results at a small fraction of the price. As a result, governments will be empowered to move forward with their building projects with as little wasted funding as possible. This post will provide a brief overview of some of the technologies that can keep land survey costs down on infrastructure projects. Unmanned aerial vehicles (UAVs), also known as drones, are increasingly being used in a variety of different industries, and land surveying is certainly no exception. The cost savings that UAVs represent in land surveying can all be traced back to efficiency. Traditional land surveying methods require surveyors to travel over active areas to complete their work. This can be an excruciatingly slow process. Also, the larger the project area and the more difficult the terrain, the longer the survey will take. 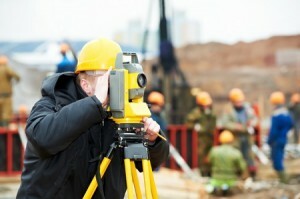 In addition to increased man hours, these manual surveying efforts frequently delay the start of actual project work. By contrast, land surveying conducted using UAVs can cover large areas in a short period of time. In fact, some drones are able to survey 400 acres in a single hour. The data format these surveys can be processed and made available to engineers back in the office quickly. As a result, engineering firms can spend less money on up front and throughout the design phase, helping to ensure that their projects come in at or under budget. Finally, today’s UAVs can make use of increasingly inexpensive HD cameras and photogrammetry to capture detailed and accurate images from above. This ensures that agencies do not have to sacrifice the quality of their results just to save money. As these cameras become more affordable, the cost of using UAVs to provide land surveying for infrastructure projects will only continue to decrease accordingly. 3D laser scanning, also known as LiDAR, is another example of a technology that can be used to quickly gather land surveying data. The results of 3D laser scanning can be used to create very detailed models and survey documents. In 3D laser scanning, a land surveyor sets up a series of scanners that emit thousands of laser points, which would then bounce off the building or terrain that’s being scanned. The flight path and trajectory of the laser beams is tracked as they return to the scanners. The scanners would then assemble the data from the various laser points into a single data cloud, which provides an extremely detailed representation of the object being scanned. Like unmanned aerial vehicles, 3D laser scanning allows very detailed survey information to be gathered in a small fraction of the time needed to conduct traditional land surveying. This means that using 3D laser scanning can help decrease the labor costs involved with any major building project. In addition, the detailed models laser scanning helps create can increase the accuracy of land surveying work. This supports lower costs by removing the potential for expensive mistakes later on in the project. With years of experience surveying roads, bridges and public utilities, Landpoint understands the unique challenges infrastructure projects face. We also have the technology needed to overcome those challenges. Contact us today to learn more about our services.